This is the first in a series* of posts about members of the Middlebury community who value the library. Today’s profile is of Oz Aloni. Where are you from and what’s your academic specialty? I’m from Jerusalem, Israel. I teach at the Modern Hebrew program at Middlebury. I’m a Semitic Linguist, which means I research languages of the Semitic family, a family that includes Hebrew, Aramaic, Arabic, Amharic, and many more. My research is focused on a language called the North-Eastern Neo-Aramaic (NENA) – in fact only on one dialect of that language: the Jewish dialect of Zakho, Kurdistan. What do you like about Middlebury? The beautiful nature surrounding us; the college’s great facilities; the friendliness of Vermonters. For my own research I use the library mainly through its online databases and resources, and also its efficient interlibrary loan service. Two of the databases that were recently added to the library’s collection are particularly valuable for me: the Responsa Project and the Encyclopedia of Hebrew Language and Linguistics [see note below]. They are also very useful for my students, as research tools for the assignments I give. How can the library better serve you? The library is doing a pretty good job as it is. One thing that can be an improvement is expanding the Hebrew collection, and I’m happy to help with that. 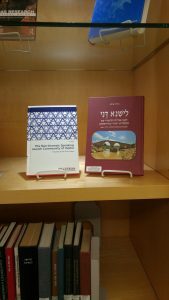 Note that the library has free access for one more week to the Encyclopedia of Hebrew Language and Linguistics while we decide whether to subscribe. Check it out! *How Do You Use The Library? is a social media series based on the “Humans of New York” model. 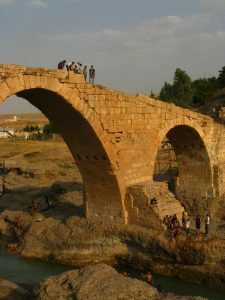 This entry was posted in How do you use the library, Library, Post for MiddPoints and tagged Aramaic, databases, Encyclopedia of Hebrew Language and Linguistics, faculty publications, Hebrew, Israel, Jerusalem, Kurdistan, Library Spotlight, Responsa Project on April 4, 2017 by Arabella Holzapfel.